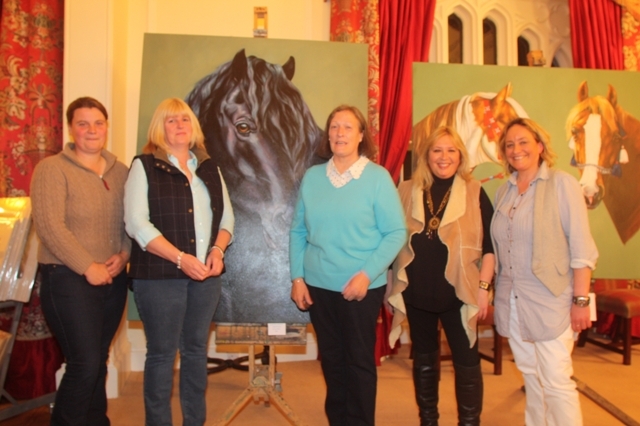 Art for the Horse, organized by sisters Aileen and Greer Ralston from Stirling, took place on 28/29th September at Strathallan Castle, Auchterarder, to raise funds for the Equine Grass Sickness Fund. Group Left to Right: Anna Roberts, Morven Campbell, Joyce McIntosh, Aileen Ralston and Greer Ralston with some of Greer’s paintings in the background. The beautiful setting of Strathallan Castle was generously made available for the event by Anna Roberts. Anna is no stranger to grass sickness either having lost several Highland ponies to the disease and she is also very committed to fundraising for this cause. A private viewing was held on the Friday evening with wine and nibbles kindly sponsored by French and Duncan. The exhibition was open all day on the Saturday and there was a steady flow of visitors throughout the day. The event provided an opportunity to see the work of some of Britain’s top equestrian, wildlife and countryside themed artists all under the one roof with a wide range of original works, prints and greetings cards available for purchase. A huge thank you to Greer and Aileen Ralston who masterminded the event, including the mammoth job of transporting and setting up the huge boards on which to hang the paintings, and to all the artists who exhibited helping to raise £1,230 for grass sickness research. Heather Carstairs and Joyce McIntosh manned a stand selling EGSF merchandise. This was well supported and a further £394 was raised from the sale of cards, calendars and prints.